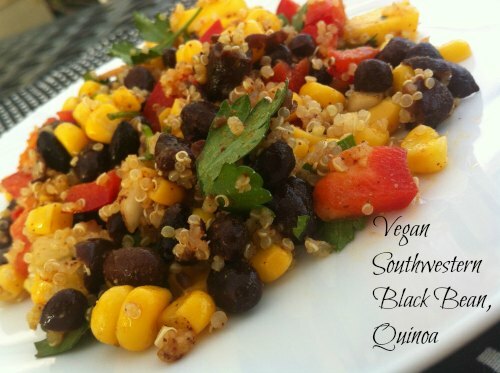 This delicious vegan southwestern black bean quinoa meal has been shared with us today by the author of The Plant-Powered Diet (The Experiment, 2012), Sharon Palmer, RD©. Not only does this meal have tons of great flavors, it is also designed to be healthy. The jewel-like black beans gleam in this crunchy, zesty salad, which is packed with disease-fighting anthocyanins, vitamin C, fiber, and lutein. Serve with corn tortillas and vegetable soup for an easy, refreshing meal. And don’t forget to pack up the leftovers for lunch the next day. Mix together the beans, quinoa, corn, pepper, mango, onion, cilantro, and jalapeño in a mixing bowl. Whisk together the lemon juice, olive oil, garlic, cumin, chili powder, and turmeric in a small bowl. Drizzle over the quinoa mixture and toss to coat evenly. Refrigerate until serving time. Nutrition Information Per serving (about 1 cup): Calories: 164, Carbohydrate: 27 g, Fiber: 7 g, Protein: 6 g, Total fat: 4 g, Saturated fat: 1 g, Sodium: 93 mg.